The spill is in a "very still" area of the waterway, which is helping contain it, Petty Officer Richard Brahm said. 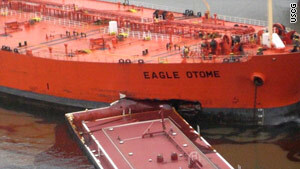 (CNN) -- A tanker ship loaded with oil in the Port of Port Arthur, Texas, collided with two barges being towed by a tug boat, resulting in a spill of about 450,000 gallons of crude, according to the U.S. Coast Guard. There is almost no water flow in the area, so the oil isn't spreading out. The spill is in a "very still" area of the waterway, which is helping contain it, Brahm said. "There is almost no water flow in the area, so the oil isn't spreading out," he said. The port is primarily for industrial use, but Coast Guard Capt. John J. Plunkett said there are environmental concerns to marsh areas both up- and downstream of the spill. He said the spill hadn't reached those areas.